Do you need a break in your week, a time to relax and have fun with your child and other moms/parents? 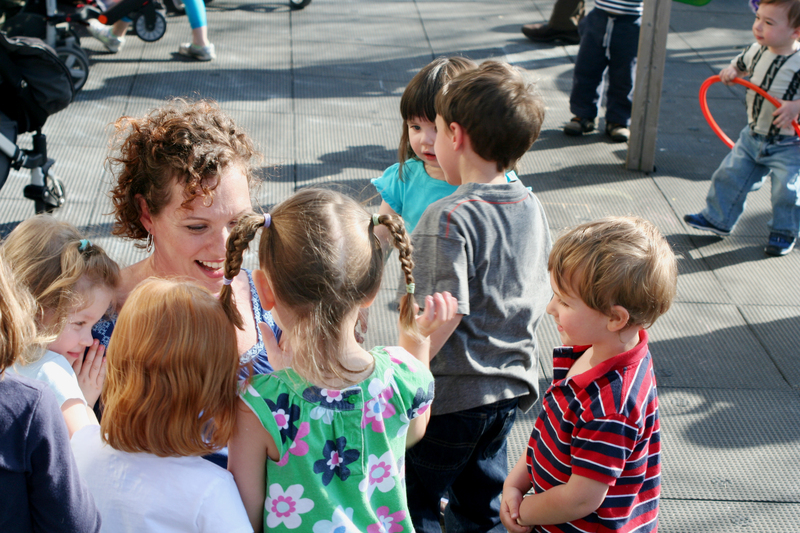 If you answered yes then you’ll love a Miss Nina Music Play Group! Would it be great if it was with other moms with children of similar ages and stages? Would you like to learn developmentally appropriate activities just right for your little one that entertain while also encouraging brain and physical development? Wouldn’t it be cool if the music was hip and fun – rock, hip-hop, pop and traditional kids-music-folk – and the group felt like a weekly party? Would you love if your child developed pre-reading skills and a love of books this early in life? It’s not just a Music Class. 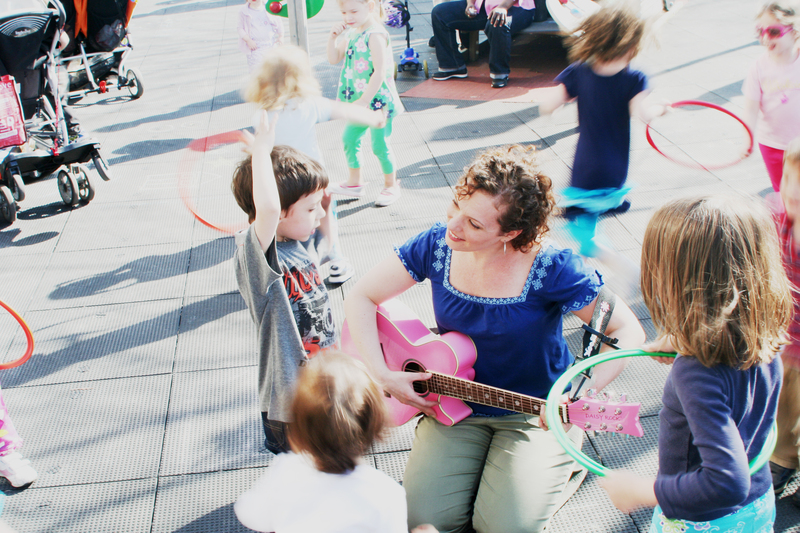 Rather, Nina focuses on developmentally appropriate concepts, themes and physical milestones and uses music and movement to explore and encourage them – while making it fun for the adults, too! Miss Nina comes to YOU! I bring my pink guitar, a small amp for some additional music playback, books, props, musical instruments, bubbles and parachute. We can rotate homes of group members or pick one host for the whole session. We meet weekly on the same day and time each week. Day of the week and time of play group to be determined between the group’s desires and Miss Nina’s availability. I base the groups around early childhood concepts (Up & down, In & out, colors, numbers & counting, etc.) with a new theme every two weeks. And I incorporate the use of props/instruments and some pre-recorded music to support the theme. But what qualifies her most to lead these groups, she feels, is being and becoming a mom. Piper (her daughter) is a now very healthy and sassy four-year-old. But back in 2013 Nina endured a harrowing labor and delivery experience that she found tough to bounce back from physically and emotionally. However, after a week in the hospital and five weeks at home, she finally had a meet-up with some friends she’d made in her pregnancy group – and it was the best medicine she could have had! She hopes that her music play groups provide an opportunity for that same sort of connection and uplift that had such a positive impact on her. She knows first-hand the importance of connecting with other parents and the need for some fun, especially in those early stages. And then having those meet-ups infused with fun music, and age-appropriate activities for the little ones makes it perfect for all involved. 12-weeks of interactive play group activities! 9-weeks of interactive play group activities! 6-weeks of interactive play group activities! Families with twins get 50% off the second twin. Children with siblings get 30% off the second child. With each option you get an extra “free” week. Don’t just take it from us, let our past program participants do the talking! Wow! Miss Nina is fantastic! 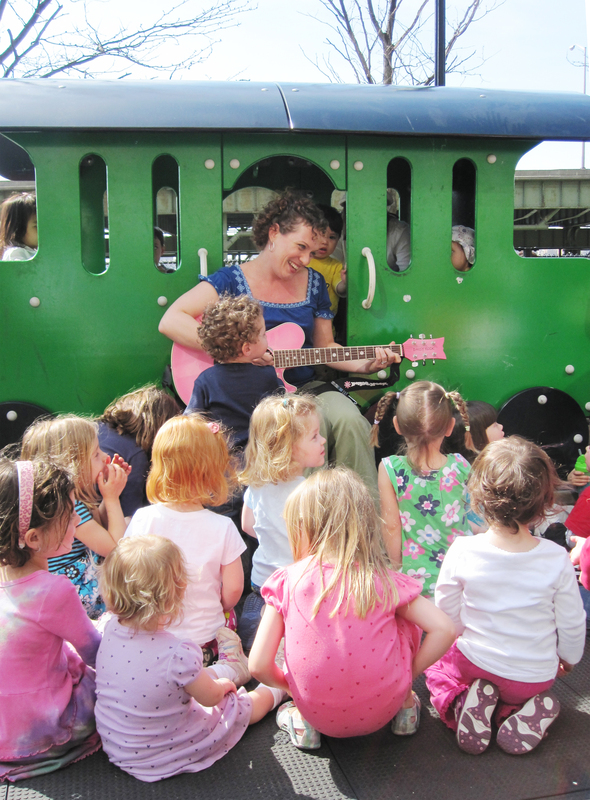 All of her songs are very participatory, which kept the kids engaged the whole time. She’s also very animated, and clearly has a natural gift for connecting with children. She takes well-known children’s books and sets them to music, and also includes a lot of participatory actions. 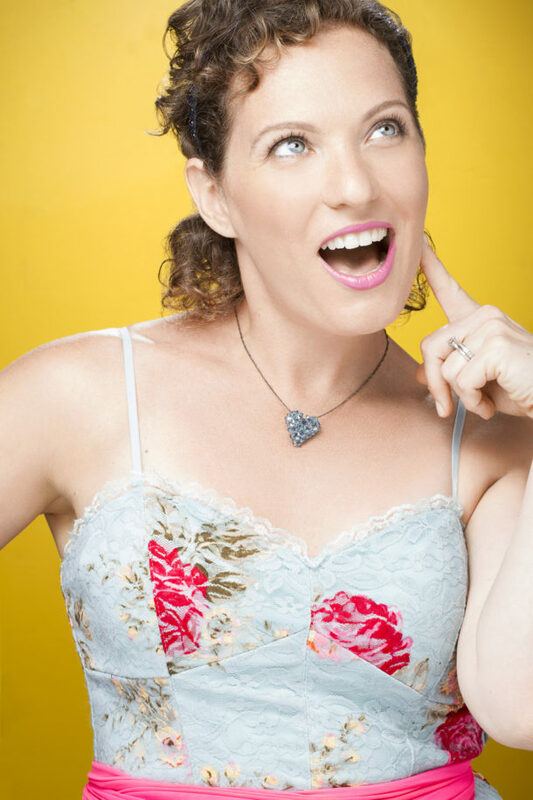 She is very experienced at managing large groups of kids, while still giving them the freedom to be kids (move around, dance, and be silly!). At the end of her program, many kids wanted to give her hugs and high fives, and I heard lots of positive feedback from the adult caregivers. I would definitely have her back to my library! When Miss Nina visited our library, we had a small, but rocking group. Not only were the youngest children clapping and dancing to the music, but we also had a couple of older elementary aged boys who were clapping with delight. Even the parents were engaged and moving to the music. Two weeks after the show, I’m still singing the refrain from Llama, Llama red pajama. Miss Nina is a professional musician with lots of experience with dealing with crowds of children; she knows how to control a group of kids while keeping them engaged. I can’t wait to have her back again!